Pheeew! It’s been a while! I feel like it’s been so long, the dust is now covering my poor blog, and spiderwebs have started to form in some corners! Eeeek! So without further ado, let me refresh my spot here, in blogosphere. As we all know, September means mainly two things: school starts again (at least in Europe) and Summer is over! So here I am again, sitting in a giant traffic every day on my way to and from work (thank Universe for the podcasts!) loosing my temper with people who should not be allowed to drive. Ever. And here I am, already panicking about short days and long nights! My neighbor came over the other day bringing me a bunch of fresh dill from her garden. Just because she is awesome like that. 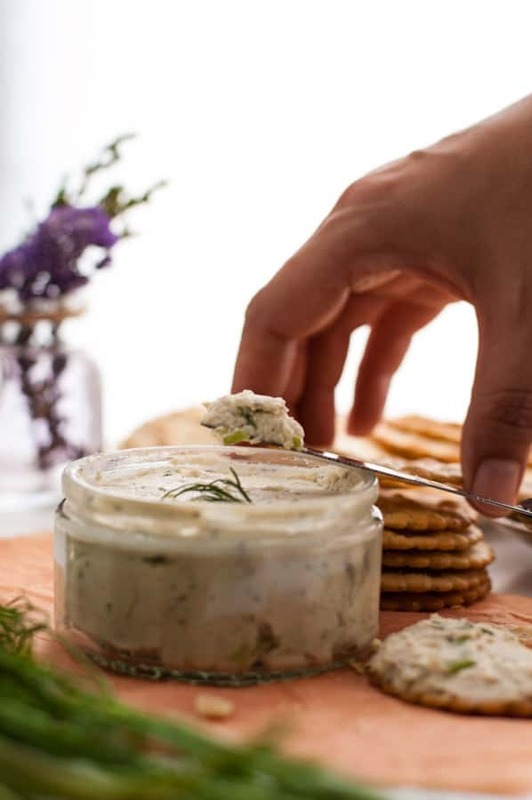 So here we are, with the recipe for this super tasty and super easy cashew cream cheese with dill, chives and spring onion. 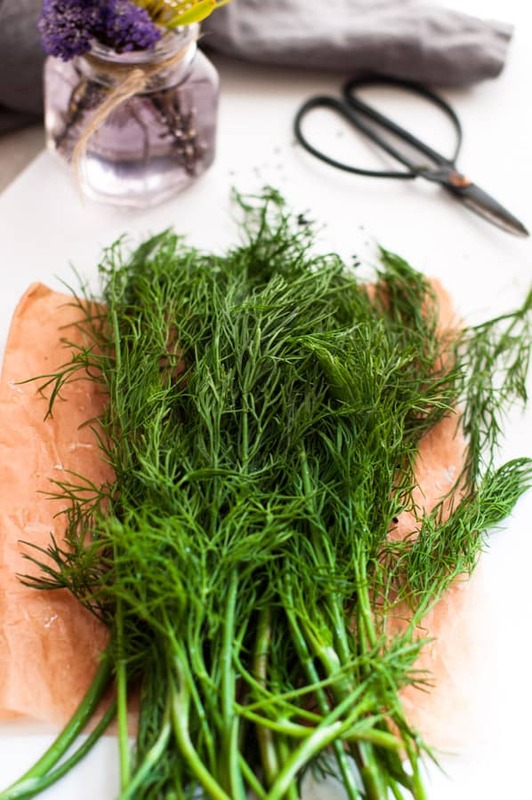 I absolutely adore the smell of fresh dill! And it always and forever will remind me of my mom’s kitchen. She always has a bunch of fresh dill (and almost every other herb known to a man) handy, just in case, and she adds it to almost everything. From potatoes to pickles, we are dill eating family. And who can blame us when it tastes so refreshing, vibrant and awesome. 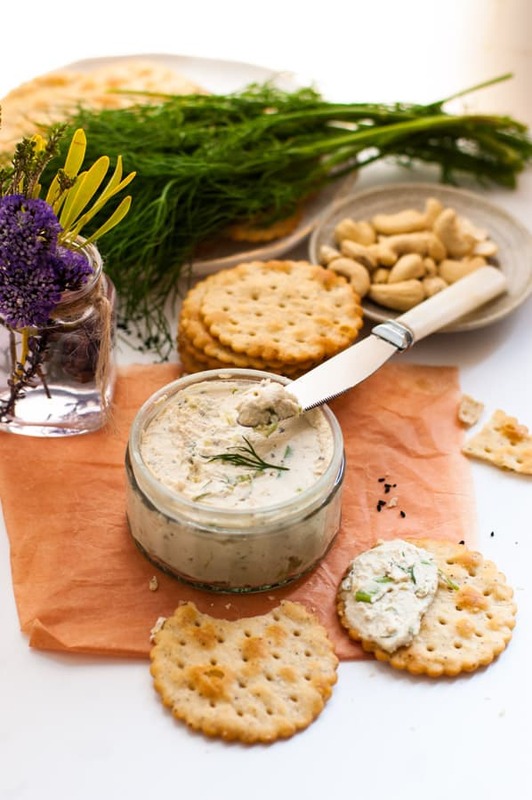 As quickly as I got my hands on this happy bunch, I made this creamy cashew cheese, adding few more herbs and some spices. And speaking of cashews…Is there anything that cashews CAN’T do? I didn’t think so. Every day I am amazed more by how versatile they are and how many different things can be made out of a simple nut. Nuts, right? Because I’m a cracker lover, my first choice when serving this creamy cashew cheese is obviously spreading a generous amount on a crispy thin cracker (sea salt and black pepper ones if you ask me personally), but it tastes just as great on a bit of toast or crispy bread. Yummo! If I have to be honest, I’ve gone cheese mad recently, or nuts for cheese, cheese made out of nuts… So just in case if you have missed my Vegan Mozzarella Cheese Recipe click here, it is one of the most popular recipes on my blog so far (everyone loves cheese!!!) and soon, I will be presenting you with spicy vegan cheddar, so stay tuned! Yay! 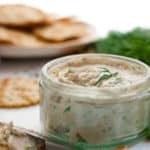 This cashew cream cheese is super smooth and creamy, rich in texture and packed with flavors of fresh herbs. Make sure you allow it to drain for at least couple of hours as it makes consistency much better, then you can transfer it to a jar or container and keep in the fridge for up to 2 days. 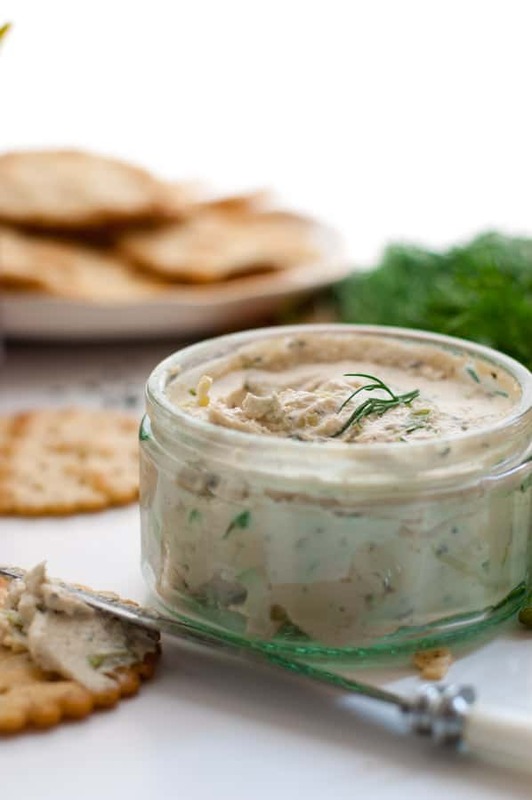 Delicious cream cheese made with cashews, stuffed with herbs, full of delicious flavors! Super easy to prepare, non dairy and vegan. Rinse cashews and place in a blender with vinegar, lemon juice and water. Blend until smooth and transfer to a bowl. 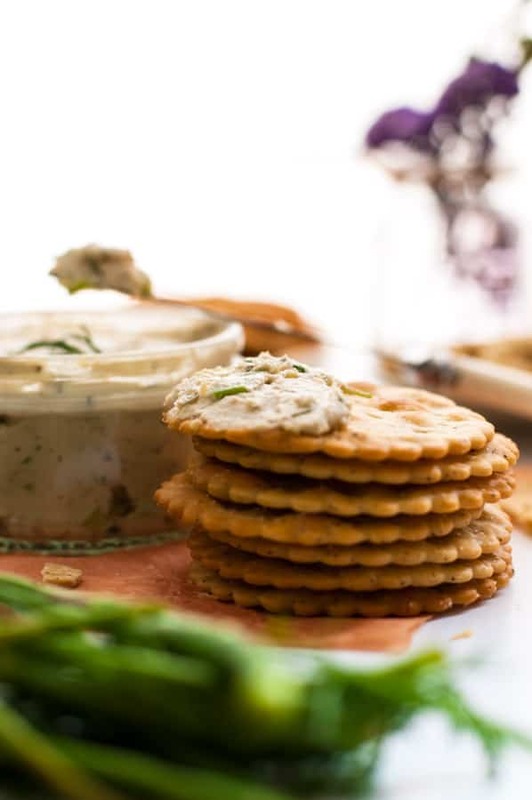 Place a cheese cloth inside a small sieve, and transfer your cashew cheese to the sieve, then place sieve over a bowl, allowing any excess liquid to drain, set in the fridge for at least 2 hours, ideally overnight. Podcasts are life svers. I don’t drive but on the tube – nothing better! 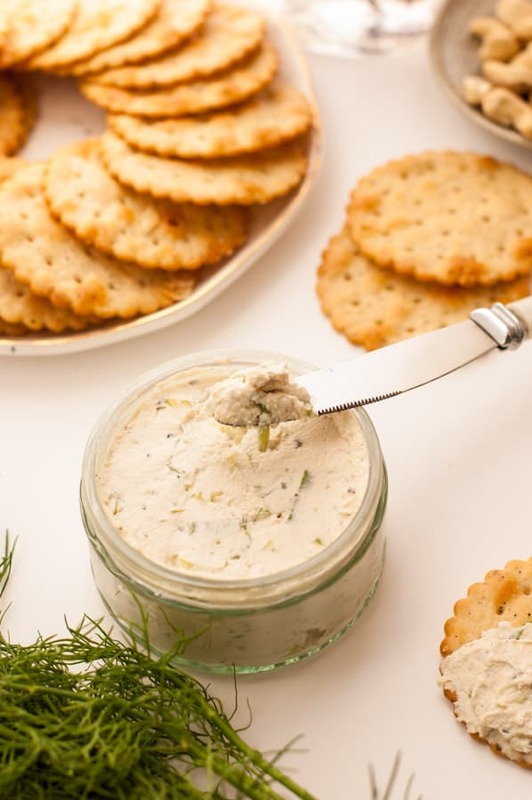 And this cashew cream looks sooooooo good. Worth the wait!